Knee conditions vary from acute injuries such as meniscal tears and ACL tears to the degenerative conditions such as osteoarthritis. Professor Papantoniou offers a range of surgical treatments. After a diagnosis of a meniscal tear has been made an arthroscopy(a small telescope procedure) (keyhole surgery) is often required to address the problem. Most torn menisci need to have partial meniscectomy to clean up loose fragments which can move within the knee joint and catch or lock the knee. Injuries of the anterior cruciate ligament (ACL) are most commonly found in the younger athlete. Mostly young men engaged in football of all varieties or young ladies in netball. Other patients include workers who suffer an injury at work or other sports men and women. Reconstruction of the ACL is done by replacing the ruptured ligament with either tendons from the hamstrings or patella tendon. Early rehabilitation allows rapid return to work but return to sports is unchanged. 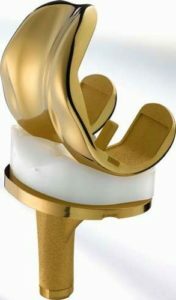 Knee arthritis, when painful and causing trouble walking usually progresses onto the requirement for a total knee replacement. Professor Papantoniou performs TKR in a minimally invasive (MIS) manner. Often referred to as keyhole surgery, this term is better reserved for arthroscopy. The incision for a MIS knee is the smallest hole we need to see all the relevant structures. Currently Professor Papantoniou performs almost all his knee replacements as both minimally invasive (MIS) and computer navigated. Computer navigation allows intra-operative adjustment of the surgical cuts to match the specific anatomy of each patient. This allows a more consistent balancing of the knee with anticipated long term benefits for the patient. an advanced pain relief technique that minimises post-operative nausea and pain. It allows walking 4 hours after the operation and eating and drinking on return to the ward.